Book your Intuitive Reading today with Angela! Ask questions Spirit- about any area of your life. Holiday Reading special on now! Looking for guidance about the path your on? Feeling like you need some insights? In love? Work? Friends and family? Angela is also a member with the FindME group.org out of Arizona. An non-profit organization for assisting law enforcement and families with locating missing persons and homicide victims. 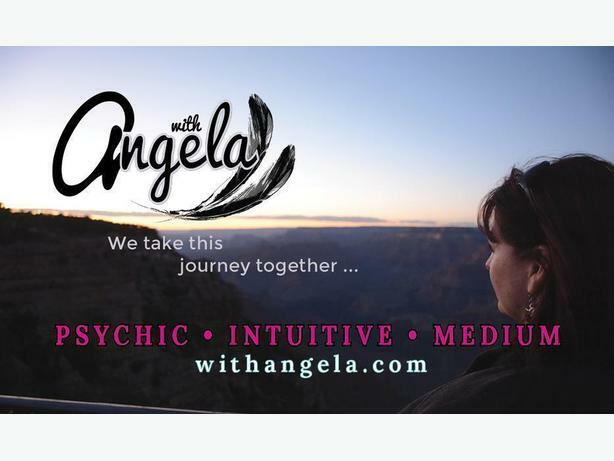 Angela spends time in between Victoria, British Columbia CA and Phoenix AZ- with her husband and three cats, offering psychic intuitive readings,classes, workshops and more. Looking for unique gift to offer- gift certificates for readings - also available! Angela was friendly and welcoming and I felt at ease on arrival. The reading she offered was something that gave me a perspective I had been looking for, and provided me healing, reassurance and guidance. I would recommend her services, as she is the real deal. ~ J.D.